The MaskedInputExtensions class allows you to further customize the MaskedInput controls controlled input. The MaskedInputExtensions.Maximum property allows you to define the maximum value that can be entered in the RadMaskedNumericInput and RadMaskedCurrencyInput controls. The MaskedInputExtensions.Minimum property allows you to define the minimum value that can be entered in the RadMaskedNumericInput and RadMaskedCurrencyInput controls. You can use it to restrict the user input to positive numbers only. The MaskedInputExtensions.MaxTextLength property allows you to define the maximum length of the input entered in the RadMaskedTextInput control. The MaskedInputExtensions.MinTextLength property allows you to define the minimum length of the input entered in the RadMaskedTextInput control. The MaskedInputExtensions.UseCultureDigits property allows you to configure the RadMaskedNumericInput and RadMaskedCurrencyInput controls whether to use the Culture settings to define the number of digits that should be displayed after the decimal symbol. If you set the MaskedInputExtensions.UseCultureDigits property to True, the number of digits displayed after the decimal symbol will depend on the culture settings. Please keep in mind that when you set the RadMaskedInputExtensions.UseCultureDigits property to True, if you want to define a Mask for the control, it has to be set after the .UseCultureDigits property in the definition of the RadMaskedInput control. When you change the sign of a value entered in the RadMaskedNumericInput and/or the RadMaskedCurrencyInput control you may need to move the cursor at the beginning of the control. You can implement such a scenario using the RadMaskedInputExtensions.SelectionStartOnSignChanged property. Beginning - when the sign of the value is changed, the caret is moved at the beggining of the control. Unchanged - when the sign of the value is changed, the caret isn't moved. This is the default behavior of the RadMaskedNumericInput and RadMaskedCurrencyInput controls. The RadMaskedInputExtensions expose an AllowMinusOnZeroValues attached property. It controls whether the minus sign ("-") in front of the zero (0 or 0.0) value can be visualized. If you set it to False, users will not be allowed to enter minus when the Value property of the control equals zero. The major difference that this property makes is when you initially have a negative number entered and you change it to zero. When the AllowMinusOnZeroValues is set to False, the minus sign will not be preserved; otherwise the minus will remain. The default value of the property is True. The MaskedInputExtensions.AllowMinusOnNullValue property allows you to display the minus sign when the value of the control is set to Null and you press the OemMinus/Subtract key on the keyboard. The default value of the attached property is set to False, which means that the described behavior is disabled by default. 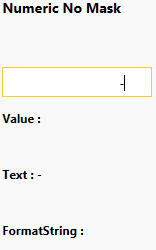 When the property is set to True and the Value is set to null, the minus symbol will be included in the Text property, however, the value will remain null. You can see the example in Figure 2. By default, the minus sign cannot be deleted on press of the Delete or the Backspace key. To change this behavior, you will need to create a custom masked input class that derives from either the RadMaskedNumeric or RadMaskedCurrencyInput control and override its CanModifyChar, HandleDeleteKeyNoMask and HandleBackKeyNoMask methods. This approach is demonstrated in the MinusKeyCustomizations SDK example. To take full advantage of a culture-specific parsing/formatting when using no mask (Mask=""), you should also set the FormatString property. In the numeric input control use n, n0, n1,..., etc. and in currency input c, c0, c1, c2,..., etc. The keyboard navigation of the RadMaskedInput suite of controls can be controlled by three properties: the native IsTabStop, the SectionsNavigationMode and the attached IsEditorTabStop properties, as shown in Example 7. You can find more information about the keyboard navigation in the Keyboard and Mouse Support help article. The MaskedInputExtensions.CaretToEndOfTextOnFocus property allows you to configure the RadMaskedTextInput control, whether to place the caret at the beginning of the text or at the end of it, when the control has focus. If you set it to True, the caret will be placed at the end of the text, as shown in Example 8. This property is designed to work only for the RadMaskedTextInput control. By default the RadMaskedNumericInput and RadMaskedCurrencyInput don't allow you to set null to their Value property. Instead the null value is coerced to 0. To alter this behavior and allow null values you can set the MaskedInputExtensions.AllowNull attached property to True. This property is designed to work only for the RadMaskedNumericInput and RadMaskedCurrencyInput controls.